Putting a bow on top of your gift is like putting the icing on the cake. 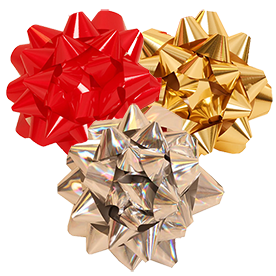 And with our Gift Bows, you'll be sure to make a statement worth giving. 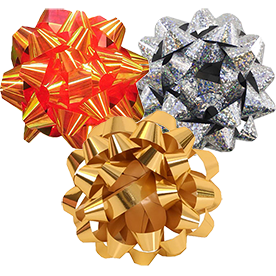 We've categorized these gift bows mainly by size, so that every bow can perfectly match how big or how small your gift is. From giant to mega, from mini to tiny, we have it all. As you click the size that is suitable for your gift, you'll find that each of our categories have a wide variety of colors too. So whether you need an ivory bow to top off your wedding gift or a red bow for those Christmas presents, you'll surely find some at JAM. 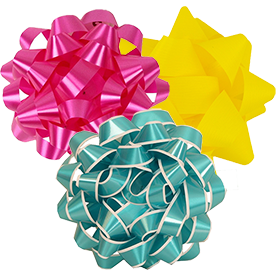 Try our Giant Gift Bows that are 13 inches in diameter. When you look at the picture, you'll see a comparison of size from our huge bows to a standard pen. 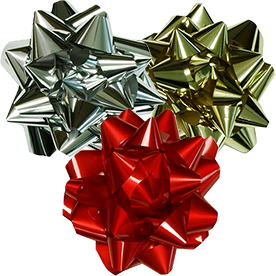 These bows are great to top off those huge gifts for your grandchildren! 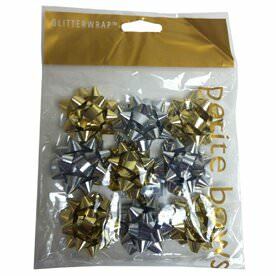 Or go opposite and try our Mini Gift Bows. 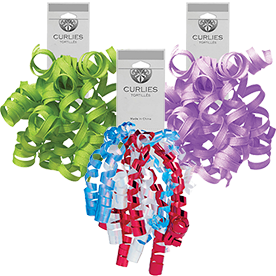 Only 2 inches in diameter, these bows will be perfect for that special jewelry set. Want all of your holiday gifts to get that special treatment? 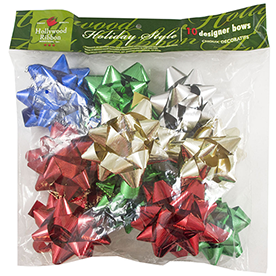 Try our Bags of Gift Bows so you can either decorate a ton of gifts or go crazy with one gift! Try our Firework Bows for a crazy pop of color! 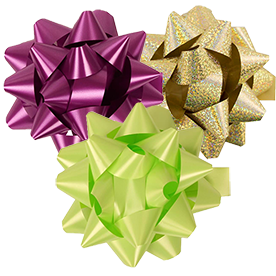 Whichever way you put it, these Gift Bows will surely brighten and color up your gifts, so start shopping now!